Ringed seals are the smallest and the most abundant of the Alaska seals. Ringed seals are the smallest and the most abundant of the Alaska seals. Ringed seals live under solid sea ice by keeping breathing holes open with their claws. Ringed seals make snow caves (lairs) above some breathing holes to rest and give birth. During the breeding season, male ringed seal’s faces turn black and they have a strong gasoline smell. Ringed seals are the most common prey of polar bears; in fact, a polar bear may kill a ringed seal every 2 to 6 days. Ringed seals are also preyed upon by walruses and killer whales. Pups are eaten by polar bears, arctic foxes, red foxes, and ravens. Arctic foxes and polar bears can locate seal lairs by smell. During pupping, foxes will tunnel into the lairs to catch the pups. Polar bears will run and jump on the snow over the hole to collapse the lair and block the exit so it can catch the mother and the pup. Females give birth to a single pup within a subnivean (snow covered) birth lair. Pups are born covered in lanugo, a coat of white wooly hair that insulates them until they can build fat reserves. Lanugo is shed at 2 to 3 weeks. The average weight of pups at birth is 10 pounds (4.5 kg). Females nurse pups for about two months and during that time the pup doubles its birth weight. Weaning usually takes place at ice breakup. Most females breed again within a month after giving birth. Implantation of the embryo is delayed until mid-July or early August so that pregnancy lasts about 11 months. Most female ringed seals first ovulate at 5–6 years of age and first give birth at 6–8 years. Males become sexually mature at the same age. Breeding takes place in April to May. During this period rutting males exhibit territorial behavior and emit a strong scent from glands of their faces; due to their scent, hunters refer to them as “kerosene” or “gasoline seals” and avoid harvesting them because they do not taste good. Polar bears also avoid male ringed seals this time of year. Ringed seals are opportunistic and eat a variety of invertebrates, fish, and amphipods. The particular species eaten depends on availability, depth of water, and distance from shore. In Alaska waters, the important food species are arctic cod, saffron cod, shrimps, and other crustaceans. 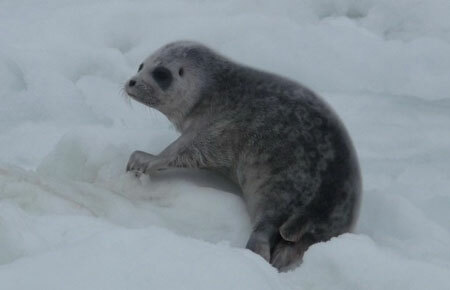 Breeding ringed seals return to the same breeding territories in heavy shorefast ice each year while juvenile ringed seals migrate south to the ice edge for the winter, but it is unknown if young seals return to their birth region when they are old enough to breed. 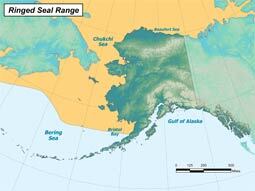 Ringed seals are also seen and harvested during ice-free periods in the Bering, Chukchi, and Beaufort seas. They often move long distances this time of year, but their movements are not well understood. Genetic studies have not delineated any stocks or separate populations and there are no reliable population estimates available for ringed seals. Numerous surveys have counted seals in portions of their range, but there is not enough information about movements and how to correct for the number of seals that were under the ice during the survey. Based upon these data, there are at least 250,000 ringed seals in Alaskan waters; the true number is probably much higher. Ringed seals were listed as ‘threatened’ under the Endangered Species Act (ESA). Worldwide, it is believed there are 6–7 million ringed seals. Because of their dependence on sea ice, there is concern that climate change may negatively affect ringed seals and their habitat. Changes in sea ice thickness, coverage, formation timing, and duration of coverage due to climate change may substantially alter the quality and amount of sea ice and snow necessary for resting, molting, and pupping. Activities associated with offshore oil exploration and recovery could affect ringed seal distribution and the prey they feed on. However, the effects of direct contact with oil and industrial disturbances on ringed seals have not been studied.